. For what we are about to receive. Home Media Sermons by Pastor Nicki Coertze Series 12 The all sufficient bread of life . For what we are about to receive. Last time I reminded you that we are not only interested in the fact of the miracle, but that the how or what Jesus did is equally important. Because in it is in the ‘how’ that our Lord worked, that there are lessons for us which affects our lives in both the spiritual and physical realm. I the last sermon we saw that even though this is a supernatural event, our Lord Jesus Christ very much uses natural things in the performance of His miracle. He makes use of that which we have in our hands, and even in that process He shows that He is creator God. Now we know that He could have done it out of nothing but He didn’t. He chose to make use of what they had as insufficient as it was. We saw that He makes use of foolish things, but that the very use of foolish things represents the wisdom of God. He makes use of our dedication as we obey and we saw that what we are required to do is to obey irrespective of the amount of faith we have and that our faith will grow as we see what the Lord does with our obedience. So what the Lord does here is to demonstrate His sufficiency by use of our insufficient means. The way that the Lord works ultimately dictates the way that we work. Whatever we are embarking on be it church buildings, or budget or ministry of whatever we need to learn from our Lord in the same way Paul did. Look at his attitude in 1 Corinthians 2:1-5 (ESV) 1 And I, when I came to you, brothers, did not come proclaiming to you the testimony of God with lofty speech or wisdom. 2 For I decided to know nothing among you except Jesus Christ and him crucified. 3 And I was with you in weakness and in fear and much trembling, 4 and my speech and my message were not in plausible words of wisdom, but in demonstration of the Spirit and of power, 5 that your faith might not rest in the wisdom of men but in the power of God. So even as ministers we realise that we are insufficient in ourselves but we rest on God’s all sufficiency. We are so utterly dependant on God and not what we have, because if we could depend on what we have we would be able to boast in ourselves. So, last time we saw that the Lord very much did the supernatural in a natural way. For today, only one point again today on the way Jesus does things. Point 1. Jesus does what He does in a thankful, dependant and joyful way. Something most of us do before we eat is to give thanks isn’t it so. Why do we do it? Is it purely out of tradition or is it simply based on 1 Corinthians 10:31 (ESV) “31 So, whether you eat or drink, or whatever you do, do all to the glory of God.” By the way, there is no ‘thanks in this verse. Or is it more to do with what we see in this text. What Jesus does here stands out in the text and has to grab our attention. He gave thanks, blessed the food and then He distributed the food. Now the question for us is this. Why did He do that? Why did Jesus give thanks? Let me ask it in another way and then you will understand why this stands out for me. Let me be blatant and I’m saying it purely from a worldly human perspective. How stupid can one be from a worldly view to give thanks for five loaves and two fish when there is a crowd between 15 and 20 000 people to be fed? Did Jesus simply do this out of tradition? It was dinner time, the table is set and what do we do, we give thanks. Did Jesus maybe do it insincerely? Everything about our Saviour demonstrated sincerity didn’t it? Now in some translations the word ‘giving thanks’ is used in all four gospels, but other translations use the word ‘blessing’. The word used in Greek here in all the synoptic gospels is (eulogesen) which is a verb in the indicative aorist active 3rd person singular form from the root word [UBS] (eulogeo) which means to bestow a blessing upon, act graciously toward (with God or Christ as subj. ); praise (with God or Christ as obj. ); ask; God's blessing upon (food). So Jesus looks up and asks God’s blessing upon what they were about to eat. The word used in John 6:11 however is a different word. It comes from (euxaristesas) which is also a verb but in the participle aorist active nominative masculine singular form. We get our word Eucharist from it. It comes from the Greek word [UBS] (euxaristeo) which means to thank, give thanks; be thankful, be grateful. You see the same word in Romans 16:4 (NIV) where Paul thanks believers for what they did for him. It shows gratefulness. You will notice in the other gospels that Jesus looked up to heaven in every rendering of the text. 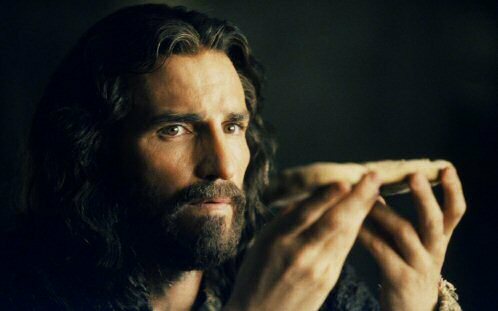 So Jesus gave the Father thanks for what they were about to eat. Something else that stands out for me here is this. Jesus has them sit down, or recline as we saw last week before He looks up to heaven to pray. Obviously that was the most practical way to feed a crowd. But also I believe He did it so that they can see Him give thanks. They are all aware that He is giving thanks to the Father for this small resource of five loaves and two fish and that He is asking His Father’s blessing on it. So not only is He giving thanks to His Father in heaven, but He is showing to them, teaching them their dependence on God. We see this for example in the resurrection of Lazarus. What did Jesus do there? John tells us in: John 11:41-42 (ESV) “41 So they took away the stone. And Jesus lifted up his eyes and said, “Father, I thank you that you have heard me. 42 I knew that you always hear me, but I said this on account of the people standing around, that they may believe that you sent me.” This is not an insincere prayer, but it is instructive. So in a sense Jesus is saying that His Father has already heard the prayer from His heart, but the prayer from His lips was for the purpose of the people. Now there are a few short lessons we can learn from this prayer of Jesus that I believe affects us in ministry and other areas of our life as well. He did not give thanks because 5 loaves could feed 15 – 20 000 people. He was not thanking His Father that He had provided enough bread and fish right there in the lunch for all those people. It is easy to give thanks for what we have before us knowing it will feed the whole family – right. There is no way that His thanksgiving was based upon the amount of their natural resources and the natural sufficiency of those resources. So what was the prayer of Jesus based upon? 1.2 The prayer of Jesus was based on the sufficiency and worthiness of the source. God the Father is the source of all blessing and Jesus could give thanks knowing that the Father had a plan in this situation and that the Father’s plan was perfect, and that the Father’s plan was sufficient. In other words, He was giving thanks not only for what they had but also for what God’s plan was for what they had. There is something else we can say about the prayer. 1.3 The prayer of Jesus was based upon the setting apart of the resources for the work and glory of God. These five loaves and two fish were now being dedicated to the use that God ordained for them. We ask God’s blessing on what is dedicated to God. We ask God’s blessing on what is dedicated for His use. So Jesus can dedicate it and give thanks in the light of the worthiness of the one who has provided the five loaves and the two fish from the outset. We can identify with this can’t we? When we give thanks to God for what we have it is NOT because we trust in what we have for our sufficiency. We don’t thank God for the salary cheque because the salary cheques are what take care of us. We give thanks, not looking ultimately to the resource itself as being sufficient in itself, but we give thanks to God as the SOURCE of all that we have and the DESIGNER for all that we have. We also take all that we have and we dedicate it to God for His purposes. Many of us pray like that don’t we. We often say something like “Father we thank you for what you have provided and we dedicate ourselves for your purposes and glory.” That does not just go for what we give to ministry but in everything we make use of in our lives because it all comes from Him and He is the one who takes care of us fully. And we know that it is not just what we have but who we are that must be dedicated for His purposes. That goes for all our talents, all our abilities and all our giftedness. You thank the Lord for it and you dedicate it to Him. Let me ask a few questions like I did last time just to drive some application home here. Who do you trust in, what do you trust in, for your sufficiency in any given circumstance? When you give thanks for what you have, what is your understanding of that thanksgiving? Is it that your thanks is ultimately for what you have alone, or is it for what you have in its relationship to the One who has given it to you, and in relationship to His plans for what He has given to you? So we should learn from Christ and thank God for everything and ask His blessing upon everything. Let me put it to you another way. If what you have doesn’t seem to be enough for what you need, how can you truly be thankful? And are you thankful? DO YOU feel that you DESERVE MORE, or that God somehow has short changed you? We all know that God has promised to take care of His children but we want to write our own spiritual salary cheques and all God must do is sign. We know the saying that someone is so skilled or equipped and sought after that they can write their own salary cheque. What has God promised us? He promised us food to eat and clothing for our bodies. Is here anybody today who can say that God has short changed us? I think we all can testify to some degree or the other that God has abundantly blessed us when it comes to material things. I am amazed just at how good God is to us when I think we all here today will testify that we have not always been good stewards of what He has given us. So if God takes care of us, but I am not happy with my lunch can I do what Christ did and look up to heaven and thank God for it and bless it. Do I believe His promises or is it based on my terms. But here is another interesting question. Do I believe that God can do more with what I have than is humanly possible? Sometimes God will even take someone who is not looking to Him, but they are looking to their material resources and God will dry it up so that they once again look at Him. Is what you have dedicated to God, or do you feel that God must be dedicated to your wants and desires? How many of you have heard of George Müller? He was a great example of a man who lived by faith. George Müller was a native German, born in 1805 and lived until 1898. He spent most of his life in Bristol, England and pastored the same church there for over 66 years. What he was best known for in his own lifetime and still today were the orphan ministry that he started. In his life he built five large orphan houses and cared for over 10,000 orphans. When he started in 1834 there were accommodations for 3,600 orphans in all of England. When he finished, not only had he cared for many orphans but he had inspired others so that 50 years after he began his work there were 100,000 orphans cared for in England. He did all of this while preaching 3 times a week from 1830 to 1898, at least 10,000 times. What is most amazing about this work with the orphanages is that George Müller never asked a single person directly for money. He asked God and trusted God to put into people’s hearts to send him what he needed. Neither he nor the orphans ever went hungry. Now I am not saying that this is the perfect model, but why did George Müller start the orphanages and why did he ask no one for money. He gave 3 reasons why he started the orphanages. How instructive are the reasons that Müller gives and the order in which he gives them. The first reason was for the glory of God, and specifically as God’s children would be taught that God can be trusted to provide what we need. Now I cannot verify these stories and have to go on the word of authors, but nonetheless. Here in John 6 there is a great need, and there is no human resource at their disposal that could meet this need. But is the Lord Jesus in a panic? Is he troubled? No, he gives thanks. Not because the resource itself was sufficient, but because the source for what they had is sufficient. He is joyful and he is thankful because of what God has in mind for the means that he has chosen to use. Is this us? Do we know this joy? Where is your faith being tested right now? What is threatening your joy right now? You must look away from your natural resources to the One who supplies all things to us. You must realize that you are not left to the sufficiency of your natural resources. You must realize that God is the One who will make use of what you have, and go BEYOND what you have, to accomplish His will. What we see in the story of George Müller seems to me to be something like what we saw the perfect Son of God did on this day when He fed 15,000 people with a few loaves and fish. He gave thanks not because of the size of their natural resources, but because of the trustworthiness and glory and power and might of the true source which is God for their resources. He gave thanks not because of what He had but because of the Father’s plans for what He had. So, Jesus does what He does in spite of who He is in a thankful, dependent and joyful way. Do you?